"The flight crew did an incredible job getting this aircraft here on the ground." 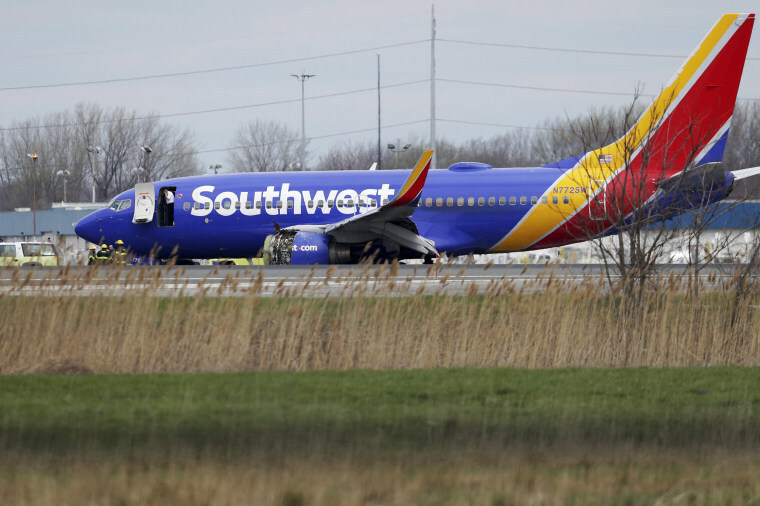 A passenger on board a Southwest Airlines plane was killed Tuesday after the left engine failed, damaging the fuselage and forcing an emergency landing in Philadelphia, officials said. National Transportation Safety Board Chairman Robert Sumwalt said multiple audible alarms went off in the cockpit around 20 minutes after takeoff as the aircraft was at around 32,500 feet of altitude. Crew members reported an engine fire and said they were initiating an emergency descent. Passengers described a terrifying experience that started when a piece of the engine apparently flew into a window midflight, shattering it and depressurizing the plane. A woman was then partly sucked out of the broken window, passengers said. "The window had gone out there," passenger Eric Zilbert said. "There were several heroic gentlemen who pulled her back through the window and administered CPR." Philadelphia Fire Commissioner Adam Thiel said earlier that one person was rushed to the hospital in critical condition and that seven other people were treated by paramedics for minor injuries. The passenger who died was identified by her family as Jennifer Riordan. The family said in a statement to NBC affiliate KOB in New Mexico that she had children and was "the bedrock of our family." Riordan worked for Wells Fargo and was a community relations leader in Albuquerque, the company said in a statement. "She was a well-known leader who was loved and respected. We extend our deepest sympathies to her family and friends," Wells Fargo said. "Her leadership and philanthropic efforts made this a better place every day and she will be terribly missed," he said. It could not be determined whether Riordan was the woman sucked out of the broken window. Sumwalt earlier Tuesday confirmed the death but offered few other details. He said he didn't know whether the person who was killed was the one taken to the hospital. The airline's chief executive, Gary Kelly, said at a news conference in Dallas that the plane, a Boeing 737-700 that has been in service since 2000, was most recently inspected on Sunday. The engine, a General Electric CFM 56-7, is "a very, very reliable engine," he said. "I'm not aware of any issues with the airplane, any issues with the engine involved," Kelly said. The dramatic incident on Southwest Flight 1380, which was flying from LaGuardia Airport in New York to Dallas Love Field carrying 144 passengers and five crew members, unfolded around 11:20 a.m. ET, when the plane was diverted to Philadelphia International Airport after the flight crew reported damage to an engine, officials said. Another passenger, Matt Tranchin, 34, of Dallas, told NBC News in a telephone interview that about 20 minutes after takeoff, he heard what sounded like an engine explosion and that a "shard of the engine hit the window." "The plane dropped immediately. Our oxygen masks dropped immediately," Tranchin said. After the window blew out, the flight crew prepared for an emergency landing, he said. "As we landed, they kept repeating: 'Brace for landing! Brace for landing!' " he said. While the plane sped toward the airport, Tranchin sent frantic goodbye messages to his family. "It was one of those things when you don’t want to terrify your family, but if you do go down, you don’t want to not say goodbye." "My wife is in her third trimester," he said. "We're expecting our first child. It was one of those things when you don't want to terrify your family, but if you do go down, you don't want to not say goodbye." Connor Martin, another passenger, was among those who saw the woman almost get sucked out of the plane. "People were pulling her back in," he said. "There was a panic once the window broke and she was out of the window. Everybody kind of rushed in to pull her back in the plane." Thiel, the fire commissioner, said, "The flight crew did an incredible job getting this aircraft here on the ground." While he didn't confirm any details about passengers' helping to pull the woman back inside the plane, he said it was his understanding that they "did some pretty amazing things under some pretty difficult circumstances." In a video posted on YouTube, Kelly, Southwest's chief executive, said the airline would do everything possible to support Riordan's loved ones, as well as the survivors. "The safety of our customers and our crew is always our uncompromising priority," Kelly said. The in-flight death was the first in the airline's history, he said. Images of the plane showed an engine appearing exposed and shredded. The engine failure drew parallels to a Southwest flight that ended in a similar emergency landing in Pensacola, Florida, on Aug. 27, 2016, in which the passengers and crew all survived. In that incident, parts of a fan blade on the left engine of the Boeing 737-700 broke off and damaged the fuselage, a wing and the tail, investigators determined. Both the make of the aircraft and the CFM 56-7 engine were the same as the ones involved in Tuesday's emergency landing. Sumwalt said Tuesday evening that investigators immediately focused on a missing fan blade. The No. 13 fan blade was separated and missing, and a preliminary examination indicated evidence of metal fatigue where the blade separated, he said. There are 24 fan blades on the engine. But the cause of the accident is still under investigation, Sumwalt said, and a full investigation is expected to take 12 to 15 months. As the plane approached Philadelphia, the crew members clarified that there was no engine fire but they reported parts of the engine missing, Sumwalt said. He said a piece of a Southwest engine cowling was found in Bernville, Pennsylvania, about 70 miles northwest of Philadelphia. The NTSB will lead the investigation, the Federal Aviation Administration said. Sumwalt said the flight data recorders would be taken to Washington to be examined. A team of NTSB investigators had arrived on the scene by late Tuesday afternoon. On the Philadelphia tarmac, passengers could be seen exiting the plane through a mobile stairway before being bused to a terminal. "There was a lot of hugging," he said. "I personally hugged the pilot. I think just relief — relief that we get to live for another day." Ethan Sacks and Phil Helsel contributed.